Brrrrrrr, I know in astronomical terms it isn't officially winter until the shortest day but with the frosts and icy winds that have blown in I certainly feel like Autumn has now departed. So welcome to our Autumn Newsletter a little round up of what has been happening with our Members during the Autumn months. Glorious golden sunshine pours into the garden and streams through the emptying beds, silhouetting the hazy shapes of artichokes, willow herb, lavender and verbena. All is still and peaceful, apart from the occasional bang of a gun, and a red admiral butterfly finding the last of the nectar from the scabious flowers. All the dahlias have finally finished now, chrysanthemums too, and the only flowers left are the nerines, which I don't like to pick yet because I want them to bulk up and make more flowers next year. For the rest of this month we will be hacking our way into the jungly rose garden, clearing the culinary blackberries which live there, cutting back the roses a little, clearing the weeds and mulching the ground. I love working in the garden at this time of year, when all is fading and earthy, imagining the good things that are going to come out of it in the spring. Back in October I was lucky enough to have the time to take a mini road trip down to Cornwall to visit Becca and Maz at The Garden Gate Flower Company. 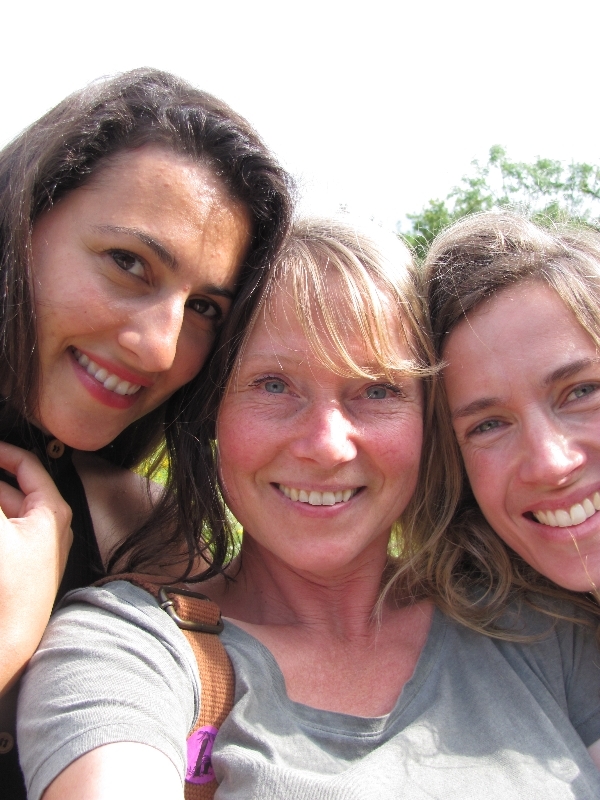 Becca and Maz had orgainsed a get together of fellow flower growers and arrangers at their farm near Fowey, Cornwall. As well as the chance for a good old natter we were allowed to cut from their flower fields and make our own arrangement, with gorgeous cakes and scrumptious soup courtesy of the girls and Becca's Mum, Penny. I shared quite a few images from the day, along with some of the arrangements over on our facebook page back in October. If you want to read about the day in more detail (and just one of the advantages of social media) then I suggest you hop over to The White Horse Flower Company blog, where Lindsey summed up the road trip to perfection, and took much better pictures than me ! 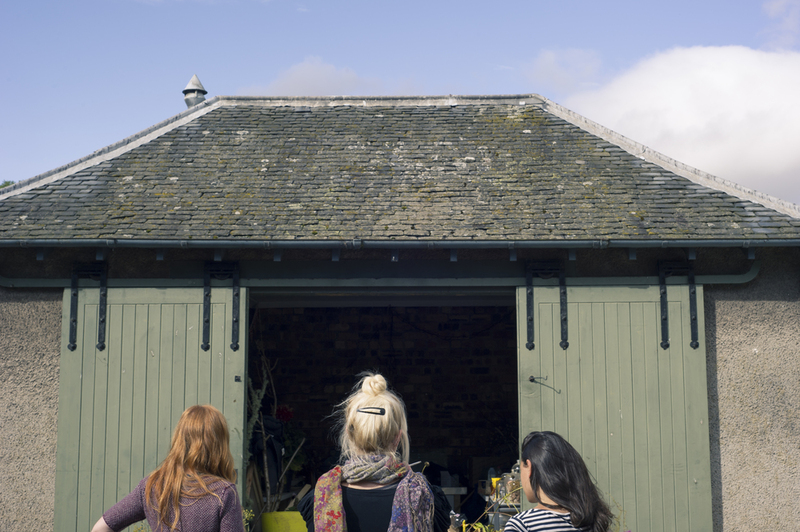 If you fancy visiting the girls on the farm yourselves hop over to The Garden Gate Flower Company website where they have an array of workshops listed from wreath making, one to one, wedding design, as well as a Dutch masters workshop with Arne Maynard in Monmouthshire. Just some of the lovely ladies (and gentlemen) that took part in The Garden Gate Flower Company fun on the farm! 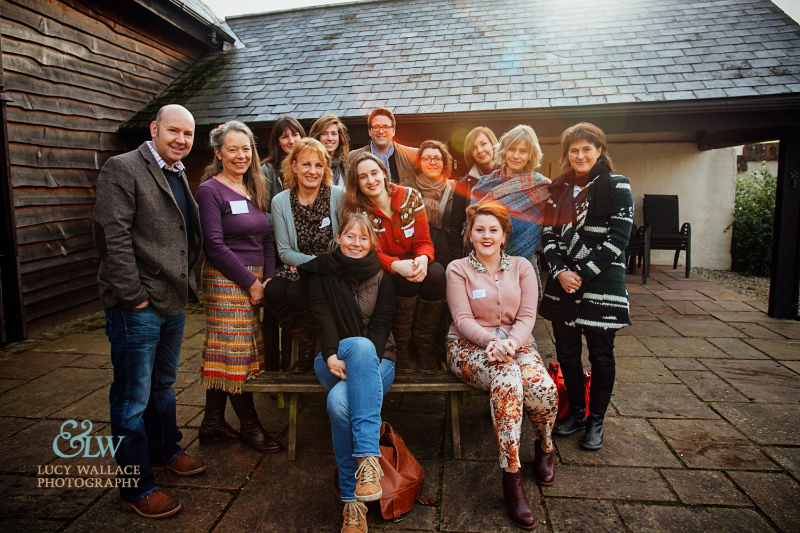 L-R = Sara (My Flower Patch), Mari (Roswartha Farm), Maz (The Garden Gate Flower Company), Susanne (The Blue Carrot), Amanda (Amanda Taffinder Flowers), Lindsey (The White Horse Flower Company), Charlotte (Rock 'n' Rosie), Chloe (BareBlooms), Thomas (Thomas Broom -The Florist). After having such fun in Cornwall and realising how important it is (both personally and for business) to meet up with fellow British flower lovers, I already have my next road trip in the diary. On the 2nd of February there is The South West Growers meet up in Cullompton Devon. I've been to the last two and come away with many new friends and a refreshed enthusiasm for what I do. You can find full details of it here , hurry though, James from Clowance Flowersinforms me places are selling fast. I hope to see some of you there. November saw me hopping on a train for a much shorter journey, down to the big smoke. I was lucky enough to be invited to the book launch of The Flower Farmers Year by The British Flower Collective member, Georgie Newbury. It is always a pleasure to have an excuse to visit the Garden Museum and what better venue to celebrate Georgie from Common Farm Flowers latest arrival ! This book is substantial in size and information. The reader benefits from Georgie's 'hard earned' lessons some of which are in handy 'boxed' easy to find sections. Making this a book that is easy to dip in and out of as a source of reference as well as a enjoyable sit down and read from front cover to back. I'd recommend it not only to those who are contemplating starting their journey with growing British flowers. It is also the perfect ingredient for 'old hands' that over the quieter months might have a bit more time to indulge in some reading and need a little ignition to that floral 'mojo' that the cold, damp weather seems to quell. If after reading the Flower Farmers Year you are greedy for some 'hands on' experience then we now have a new page to our website containing a list of up and coming courses/workshops from members of The British Flower Collective. I was off out again at the end of November to South Oxfordshire and the enviable studio of Jo from Floral Circus. Flower grower, Juliet Bennett and floral designer, Jo Wise grabbed the London art scene’s attention with a 12ft high pair angel wings made entirely out of flowers grown in rural Oxfordshire and the UK. Their ambitious art installation, called “I believe in Angels” won Winter Prides Alternative Arts Award at Tobacco Docks in East London this weekend. 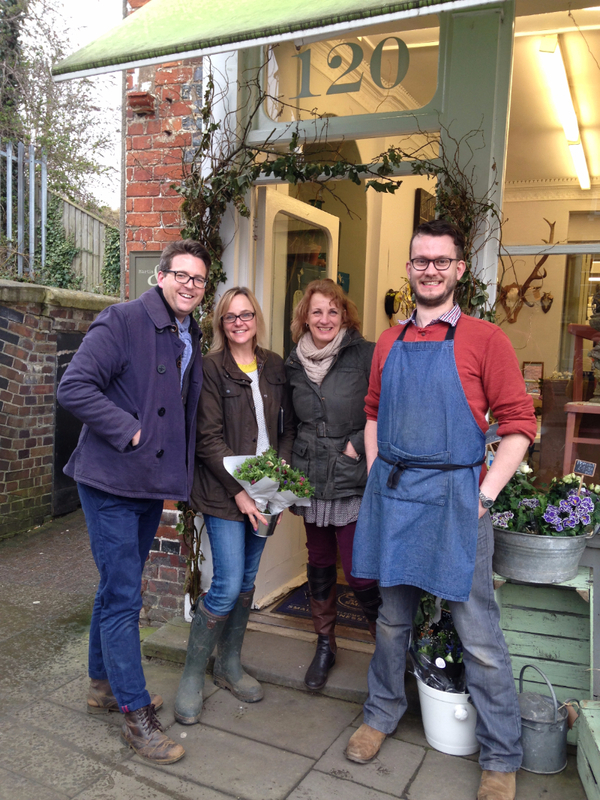 Juliet, from Babylon Flowers in Watlington and Jo Wise from Floral Circus in Benson are both passionate champions of British-grown flowers, and set out to create a piece of art which was both magical and theatrical, but was also 100% natural. Juliet and Jo said they were both “truly shocked” to find themselves on the winning podium. But they’re also "incredibly proud" of being able to demonstrate there's so much more to British Flowers than cottage arrangements in jugs. 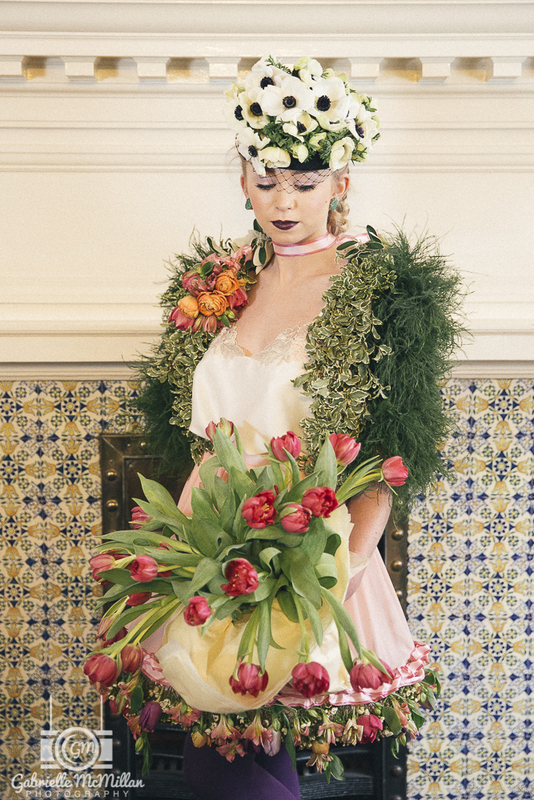 British-grown blooms can be used in many innovative ways to create truly enchanting visual compositions. Juliet and Jo of Babylon Flowers and Floral Circus. Images Ren Brocklehurst. Well Autumn certainly was a busy one. Time (after Christmas) for a little feet up and perusal of those tempting seed catalogues as well as a good front to back read of Georgie's book! Festive Wishes, hope you get some flowery goodies in your stockings! As I sit and begin to write this on the Autumnal Equinox it is with equal measures that I mourn the end of summer and welcome the start of a new season. The best thing for me about using seasonal British flowers is that no two months, weeks, or even days are the same. There is always a new bloom, seed head, scent in the air to welcome or look forward to. Although I will miss the exuberance of the summer blooms, the scent of the Sweet Peas, etc I know that if I experienced them all year round I would not appreciate their beauty and would not long for their arrival again next year. It's been with a little sadness but a huge feeling of liberation that we've decided to give up our weekly Ludlow market now, in order to concentrate our energies on event flowers and regular local deliveries. The regret comes from giving up that weekly contact with our local customers which has been so much fun, and which has made us feel like a 'real' local business, with a proper place in the life of the town. There's always much chatting to be done, about flowers and everything else, and it's a great way of keeping a sense of proportion when the two of us spend most of our time stooped over a flower bed within our garden walls, listening to the dog run about barking at pheasants. On the other hand, takings for all the stallholders seem to have been going steadily down over the last year, and the energy that we were putting into the market was not always being repaid with profit. We found it very difficult to charge respectable, florist-level prices on a market stall, and low prices coupled with low footfall have eventually made us see that our energies can be better used elsewhere. Happily, the tailing off in market interest has coincided with a surge in wedding enquiries and bookings. While the relationships we build with wedding couples through email exchanges and a few short visits are different to those built up gradually week on week with our local customers, the quantities of flowers involved with decorating a wedding, the time and (we hope!) skill that go into making up the more fiddly bouquets and buttonholes, and the guarantee that the flowers will be wanted once picked and arranged – all these factors mean that party flowers are the way to go for us. Last year's dahlias were good, but this year's are really stunning. Dahlias are one of the crops we have decided to focus extra activity on, having noticed how dramatically they respond to a bit of special fuss. Having planted them (eventually) in holes with bonemeal and garden compost, we then kept them weeded, mulched and fed throughout the summer, and now the big dahlia bed – a stolen third of what was the vegetable garden – is a veritable sea of spiky, pompommy, gregarious colour. Barney's unpatented sheep wire supports have worked a treat, and the dahlias grow up through the horizontal mesh with no need for tying in. Special favourites this year include spiky peachy Preference; pink ball-like Peter, the perfect cut flower with it's long stems and longlong lasting qualities; Kafka for its sweet compactness and cheeky purplish bonbon faces; and a mystery old variety, red-and-white bi-coloured in some blooms and blush white in others, which was given to us by a kind elderly neighbour who has since died, aged 96, and whose gift we will treasure – and protect from slugs. Thank you, Sybil! The end of Summer also seems to be a time when most Brides start making enquires for their weddings next Summer. I am sure many of you have already watched thisvideo by Alison Ellis from Floral Artistry but if not I highly recommend having a look. I guarantee it will instil you with confidence when booking consultations and writing quotes not to undervalue yourself. I am always casting my eye over our Members social media to keep up to date with the exciting things they are up and the gorgeous work they are creating. I was rather excited (and rather jealous) when I saw that Brittany Asch (BRRCHH) was in the country visiting our Members in the North and South. Amanda (Taffinder) and I had a really great, relaxed afternoon with Brittany. We met at my garden and I let her loose with a pair of snips and a bucket to create something with my flowers. It was so great and inspiring to see someone else play with the fruits of my labour. After that we made a trip to the nearby lost gardens of Heligan. On the way back we popped by Amanda's workshop and walled garden and wondered amongst the roses with a nice glass of wine. It was fantastic to chat with someone at the top of her game very open and honest about the ups and downs, ins and outs of running a floral design business. 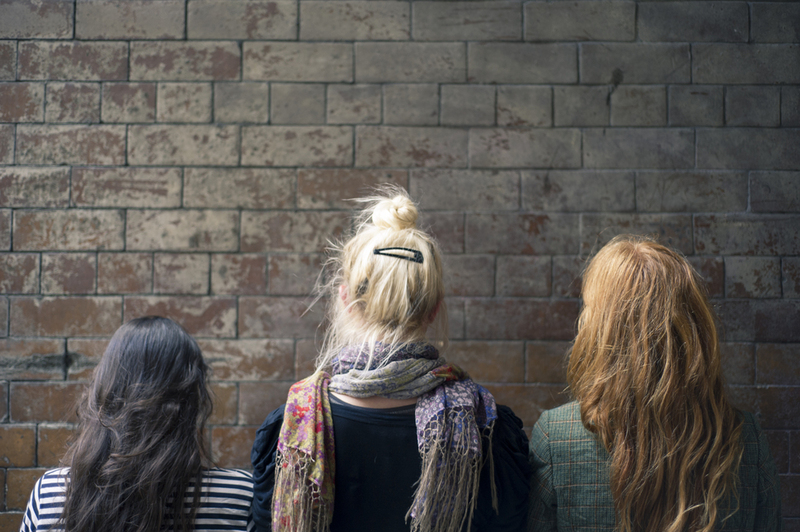 It gave me a much needed kick in the backside about self valuation, pricing and confidence. Earlier this year we were contacted by Brittany Asch of BRRCH; she was planning a UK trip and a mutual flowery contact in NY had suggested she got in touch. Of course we were delighted to host the Scottish leg of her trip, particularly as she was keen to come along and help with our events (the best assistant we've ever had!). Amazingly, she landed on the red eye from the US, jumped straight on the train to Edinburgh and within hours found herself on site at a wedding venue in Perthshire. What began as a loose plan to show her around ended as a week long stint with us with plans to return after she had visited the Highlands. We had been talking about collaborating on a public botanical installation so, while Brittany explored the rest of Scotland, we arranged for a photographer, film maker and poet to work with us for a day to create a site specific piece on Edinburgh's Royal Mile at the start of the Edinburgh festival. It was wonderful to work alongside another florist with similar ideas to our own and there was much talk of further collaborations, hopefully stateside next time. Watch this space! If you missed the lovely video of their installation by altermotive films you can view it here on their Facebook page. We could not be more excited and proud to announce that Georgie fromCommon Farm Flowers has a book coming out next month. The Flower Farmer's Year is released on the 23rd of October and will be available in all good book shops. You can read more about it, including rave reviews by clicking on the image. A couple of months ago I was contacted by an old friend – Richard Fishbourne of Bugs and Beasties (www.bugsandbeasties.co.uk). He was organising an event at the RHS Malvern Flower Festival in the ‘Get Going, Get Growing’ arena and asked me to be involved. I initially said no as I had my first wedding of the year on the Sunday of the show but no didn't seem to be an option and I found myself setting up at Malvern on Wednesday 7th May feeling slightly apprehensive! Richard had also just sprung the news on me that he would be introducing me to HRH Princess Anne on Friday and could I do her a small posy! Realising that I couldn't do this on my own I roped in my friend Nicola to help and we had an absolutely fantastic time at the show. There was a sense of overwhelming support for the use of seasonal, British flowers and foliage. We had many warm comments about our stall and all the vintage bits and bobs that we displayed flowers and plants in – everyone seemed particularly taken with planted up cups and saucers and teapots. Wedding enquiries came in from London, Cheltenham and North Wales and we were exhausted at the end of each day from talking so much! Meeting HRH Princess Anne was fantastic and a real honour, she immediately put us at ease and took a keen interest in what we were doing and trying to achieve. We gave her a hand tie of lilac, rosemary, Solomon’s seal, pinks and stocks. It was great to see pictures of her carrying her flowers long after she had left us. The Sunday morning found us in Coleshill at half past nine at the gorgeous wedding venue, Shustoke barns. www.crippsshustoke.com. This converted barn is a relatively new venue and I had done one wedding there last year not long after they had opened. After dropping the bridal flowers off in the village and finally meeting the lovely bride to be Nina – who had arranged her wedding all the way from Australia we sped back to the barn and arranged 50 jam jars before driving back to Malvern (only getting slightly lost!). We had left the stall in the capable hands of my mother Sheila and her friend Janet. Mum ended up on stage giving a flower arranging demonstration with Terry Walton. I wish that I could have been there to see it! Nicola and I have decided to join forces and throughout the four days that we spent in Malvern we came up with loads of ideas and plans for the future – we have already tackled one major job – clearing out my shed and turning it into a dedicated flower arranging area. (Though it does mean I now need another shed for all my pots and tools!). All the good things of the summer begin to show themselves in the garden. Allium globes hover over drifts of catmint and lady's mantle; the young rose bushes grow fat round buds with a tantalising flush of colour; toadflax, lupins and foxgloves send up grateful spires of pink and white and purple; sweet peas offer us the first fragrant flowers to pick; late-planted dahlias (very late) show signs, and we are ever-vigilant against slug-attack. So many of the things we have never grown before. I am so excited to watch and pick the first of the pinkish Gladioli byzantium, which I have only ever seen before in a Greek olive grove. They look so elegant on our market stall in amongst the blowsy late Spring standbys. Allium bulgaricum (Nectaroscordum) looks almost alarming in the Hot border, growing against the tall south facing wall, with its spooky grey pendulous flowers looming threateningly above the smaller garden chrysanthemums and artemisia 'Powis Castle growing there. Although I'm ashamed to admit it here, I don't think I have grown sunflowers since I was a child. This year I sowed them in pots undercover, and they are now planted out in the ground. Not really knowing what they should do first, I watch them anxiously for signs of thickening stems and swelling flower buds. They look small and skinny still, with strange mops of green at the top. Nor have I ever grown Campanula medium from seed before, but these promise to be a glorious success, having formed massive plants during the last growing season, and now crammed in together in the rose garden, they squeeze out everything else. I long for the sun to come out and make them open, so that I can pick them for the delight of our first June bride. - Rachel Petheram of Catkin still has a few places left on a few of her courses, check them out here. - Field Gate Flowers have a DIY wedding flowers workshop on the 29th of June. 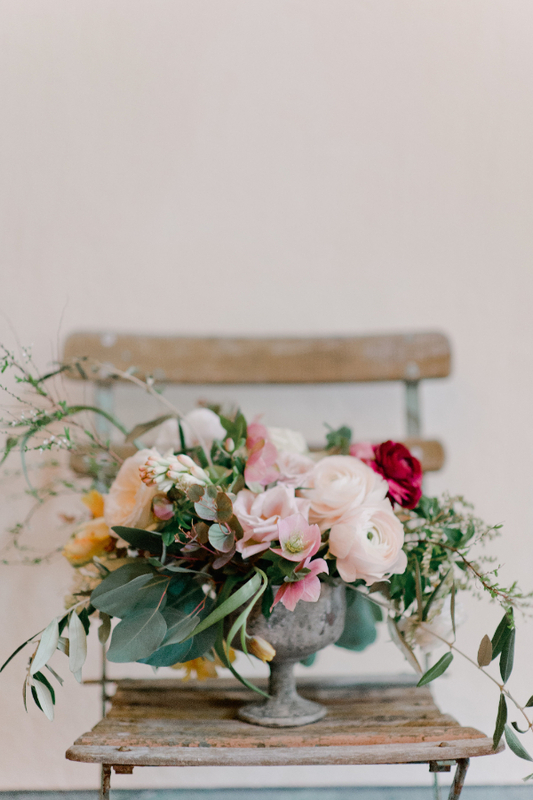 - Floral Circus have an arranging wedding flowers course on the 6th of July, anarranging with garden style course on the 9th of July, as well as other workshops and floral parties. "Drip drip drip little April showers".....luckily we have seen some glorious sunshine too, all a winning combination for new growth and our green and pleasant land looks very green and very pleasant again. The Flower Festival is being held for charity at Hurstpierpoint College Chapel in West Sussex and will be open to the public on Saturday 14th June from 10-5pm. The Chapel. Some of the money raised will go to the 'Font fund'. The festival is titled ‘In England’s Green & Pleasant Land’ and all the designs will be themed around Songs & Music…..think Vivaldi 4 Seasons, Sunny Side of the Street etc. Parents, children and staff at the school will be helping to make the arrangements using only British flowers & foliage. Another feature of the festival is that no floral foam will be used with the majority of vases and containers being recycled. One of the British Flower Collective members, Georgie Newbery ofCommon Farm Flowers in Somerset, has already agreed to sponsor one of the designs and I have also received support for the venture from Shane Connolly and Paula Pryke. I am very pleased to hear that floral foam has been 'banned' and I hope some Members are able to help Belinda in her quest for British Flowers. We Welsh Marches growers were in luck this month, as the ballerina-perfect and photographically gifted Sabina Rüber treated four of us to a lesson in flower photography. We all brought along buckets of flowers to the lovely farmy headquarters of Tammy Hall (Wild Bunch), where we first spent a good hour marvelling at Tammy's luscious field of Tulips, all wishing we could just lie down in them. Sabina recommends taking this principle to further extremes and making the camera focus on only one part of the picture - say, the most glorious flower in a bouquet - with the rest of the picture a little swimmy and out of focus. She showed us this on her own camera, and it does certainly add an element of atmosphere and mystery to the pictures. This Magic Photographer does however have a Magic Camera to do her photographic skills justice, and the effects achieved by her machine are perhaps beyond the possibilities available to most of us. Next, light. We sat in different positions relative to the big window in Tammy's flower studio, and noticed the differing effects on our features. Sitting in direct sun was harsh; sitting to the side of the window, in a well- lit position but with no sun shining on our faces, was more flattering. The same goes for where to position flowers. Sabina also showed us how the background in a photograph can strongly influence the success of a photograph. A light bunch of flowers, for instance, which is positioned very closely to a light-coloured background, simply vanishes into the photograph. Last but not least, this months Newsletter is late due to a fleeting trip to London to take part in the 'Little Flower School' course. It was lovely to catch up with a few of you and a shame to miss those of you that were on the two day course. There is so much loveliness to share that it would be great if those of you who took part would be willing to help me put together a Collective blog on our experience. Cathy and I have been meaning to set up a 'The British Flower Collective' blog for ages and now seems as good a time as any, especially with so many gorgeous arrangements to share, even if they are not 100% British grown. If you are interested than please drop me an email. I'd love images of your work and any text would be welcome, especially from the two day course girls. We all had such a fantastic time (trying not to rub it in to those that weren't there) and I think we all agreed that we need to organise a big 'The British Flower Collective' meet up when the season has calmed down. Talking of blogs, I have been approached by the Fennel and Fern blog asking if our members would like to contribute. It would be nice to feature a different member each time. Obviously this is not compulsory, but if you are interested than drop me a line. The British Flower Collective members from the Monday course. L- R : Amanda Taffinder from Amanda Taffinder flowers, Susanne from The Blue Carrot, Chloe from BareBlooms, Thomas from Thomas Broom - The Florist, Fiona from Pyrus and Natalya from Pyrus. Our glamorous teachers for the afternoon. Nicolette from Nicolette Camille and Sarah from Saipua. Copyright © 2014 The British Flower Collective, All rights reserved.